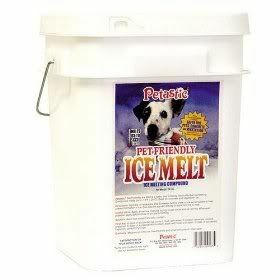 Pet safe ice melt is a specialty product that addresses some of the worst winter hazards pets face. 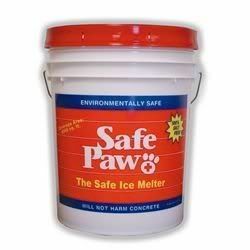 Did you know that snow and ice melt products remain among the most hazardous winter dangers to pets? Ice melts might be encountered on walks during the winter months. Risks to pets can come from product that has spilled out of bags, that is applied to sidewalks or streets, or that has been improperly stored. Dry, sore, and cracked paw pads are one problem but the ingestion of such products is a bigger danger. When a pet walks or rolls over surfaces that have been treated with ice melt products it can collect onto the bottom of their paws and then is ingested when the pet licks those areas. So, the first thing to do is be aware that when you return with you pet after outside winter activities and take steps to wash your pet’s paws and legs–and if you pet rolled in suspect areas it might be a good idea to bathe him or her. The most common signs of ingestion of non-friendly ice melt products are vomiting, diarrhea, excess salivation, lethargy, loss of appetite, disorientation, increased drinking, seizures, and even death. Ingesting large amounts of sodium levels can be lethal in dogs leading to sodium toxicity which comes up quickly and is mainly neurological. Most common symptoms include increased urination and digestive upset. These can lead to dehydration and increased risk to the animal. Ingestion of potassium chloride can cause bowel strictures and ulcerations. Symptoms include muscle weakness, gastrointestinal upset and cardiac function issues. Elevated magnesium can drop the blood pressure drastically and cause cardiac abnormalities, weakness, and neurological issues. These products cause vomiting and eye irritation. Urea is a bio-degradable chemical that is most commonly used in fertilizers. Ingestion usually triggers hyper salivation, gastrointestinal upsets, and abdominal pain. Inducing vomiting is controversial and not a good idea with many of these ingredients and activated charcoal does not absorb the salts in ice melts. 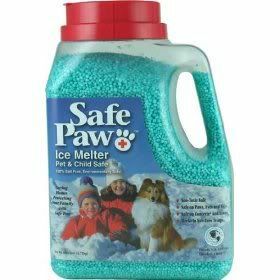 Sand or clay cat litter are safer options to use instead of ice melts but new pet friendly ice melts are now also on the market. Users report good success with most of these products except for complaints about the “snow cone” color of the granules in some of the products. In my area the roads are not salted but cindered (volcanic cinders) instead–so the issues arise in areas where people are using salt on private or business property. Below are some of the most popular products (just click on the image or link). Paw Thaw and the Petco proprietary brands are two other products on the market but not highlighted here. Finally, if you suspect that you pet has ingested a de-icing snow melt product get your animal to the veterinarian immediately and keep the animal poison hotline number on your fridge and in your cell phone. Many people are not aware that in the summer of 1996, the ASPCA acquired the National Animal Poison Control from the University of Illinois. The ASPCA Animal Poison Control Center remains an Allied Agency of the University of Illinois College of Veterinary Medicine and you can reach the ASPCA Animal Poison Control Center hotline at 1-888-426-4435. 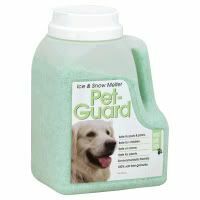 I’d be interested in what your preferences are for pet safe ice melters–if you have used these products. Drop me a line in the comments and let me know. This really answers some questions on ice melt. My Golden has always been healthy and about a month ago she started having some issues. Every 5 days or so she would vomit once or twice, need out more often, and wouldn’t eat although she still mooched. We had blood work done and her WBC was elevated, her kidneys were near normal, but a little elevated. She went in again on Friday and had an ultrasound done and has fluid around her heart which they tapped and removed. A little has come back and that they will remove today. Of course it being the weekend won’t know til Monday afternoon the results of the fluid. The reason I write is that she is a real big paw licker after coming in from outside and unknowingly we have been using ice melt that is dangerous. Wow Sharon, I am sorry to hear about your dog but glad that you got her to the veterinarian. The symptoms may be related to ice melt ingredients and it will be interesting to see what the results find. 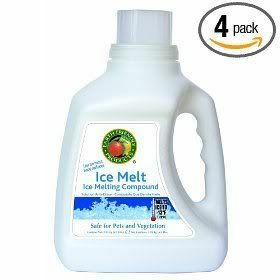 Both the vomiting and cardiac issues can come for regular ice melt so I hope your dog pulls through and that you help spead the word on animal friendly and environment friendly ice melts listed here.